One more post for tonight. I found a cute Graduate image at the Saturated Canary Shop and needed one more Grad card - so - I got right on it tonight. The image is colored with Copics. The DP is from Bo Bunny - Country Garden Collection. I used ribbon and a pretty blue button from my stash. The Sketch is from Sweet Sketch Wednesday and their sponsor is Saturated Canary =) So, I am also entering this card in their Challenge - Anything Goes. Hope you got some good sleep. Love this card, the image is adorable and love you you popped it up on the card. 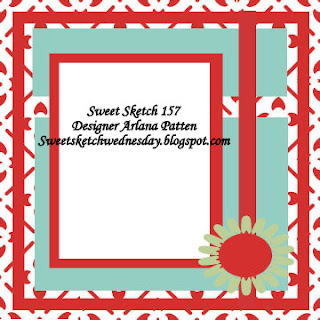 Always happy to have you join us at Sweet Sketch Wednesdays. Oh Sally, what an adorable graduation card. I love how you popped the image. Your papers and color scheme are perfect. Really a cute card. Thanks for joining us each week. What an adorable graduation card and I'm so happy you used one of Krista's images too! Terrific creation! Thanks so much for joining us this week at Sweet Sketch Wednesday and be sure to come back again and play along with us. Hello Sally, She is so adorable! I love how you popped her. She definitely stands out. Love that sheer delicate ribbon that adds to her femininity. What a lovely graduation card! Absolutely adorable Sally! Love your girl graduate! Soft and sweet. Thanks for joining us this week at Sweet Sketch Wednesday. Your card is adorable. Love the blue color. Hi Sally I do love your graduation card, great colours and I love how you popped the image it really stands out. 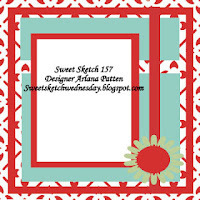 Great card and thanks so much for joining us this week at Sweet Sketch Wednesday and good luck. This is another terrific card Sally! I adore this image and am heading over to get it at SC in a minute! The blue theme is lovely and your coloring of the image is wonderful. I like that she stands alone popped up on the card. Aways good to see you playing along with us at SWW! Sally, I love that dp and glad you found such a great image!! Great job on coloring up your image. Love your gradguation image and sweet colors. Have a sweet day!!!! Arlana@SSW!! !